It’s easy to talk about the sample rates for sessions, but how much do you know about it? In this article, I’ll answer a few questions about sample rates. Sample rate is literally how fast samples are taken. Picture an analog audio track. A “sample” is a measurement — a snapshot, if you will — at one specific time in that audio track, described in the binary language of 1s and 0s. Repeat that measurement tens of thousands of times each second; how often that snapshot is taken represents the sample rate or sampling frequency. It’s measured in “samples per second” and is usually expressed in kiloHertz (kHz), a unit meaning 1,000 times per second. Audio CDs, for example, have a sample rate of 44.1kHz, which means that the analog signal is sampled 44,100 times per second. If the sample rate is 44.1kHz, the highest frequency that can be captured and stored is a bit less than half of the sampling frequency, or around 22kHz. Remember that the accepted standard for the human hearing range is from 20 Hertz to 20,000 Hertz (or 20kHz), though in practice, most of us don’t hear frequencies that high. Age, exposure to loud sounds, and environmental issues lower sensitivity to high frequencies. Raising the sample rate to 48kHz raises the Nyquist frequency to just under 24kHz, and recording at 96kHz moves the Nyquist frequency to just under 48kHz — well over an octave beyond the range of audibility. What Does Sample Rate Do? You’ll hear people suggest that sample rate measures or captures a lot of things, but it really only does one thing: measure frequency. That’s it. So how did we end up with 44.1kHz as the “standard” sample rate for so many digital formats? According to what I’ve been told, in the early days of digital audio, 48kHz was the “pro” standard, and manufacturers wanted to use a different rate for “consumer” devices to prevent direct digital copying. It’s not easy mathematically to convert digital audio from a sample rate of 48,000 to 44,100; so this sample rate was chosen for consumer gear for it’s incompatibility with pro gear. If 44.1kHz Captures More than We can Hear, Why Use Higher Sample Rates? There are a couple of reasons that higher sampling rates can be advantageous; the first is that while 44.1kHz is the standard for audio CDs, 48kHz is the standard for audio for video. Studios who regularly work in film and television may use 48kHz as their in-house standard. But higher sample rates such as 88.2kHz, 96kHz, 192kHz, and even higher may have a purpose — and maybe not the one that you think it is. Remember what the Nyquist theorem states: frequencies below half of the sampling rate can be reconstructed. So what happens to frequencies that are more than half of the sampling rate? The theorem states that any frequencies above the Nyquist Limit will not be rendered properly, and this proved to be true; frequencies above the limit can appear as spurious signals in the audible audio spectrum. This is referred to as “aliasing,” and must be prevented by band-limiting (filtering) the analog audio before it’s converted to a digital format. Effectively, this means that analog-to-digital converters (ADCs) have a low-pass filter at the Nyquist Limit that stops those out-of-bandwidth-frequencies from getting to the converters. The implementation of that filter in the ADC is key; if done well, it should be completely transparent; done poorly, the filter will degrade the quality of the audio. By sampling at 88.2kHz, 96kHz, or even 192 kHz, the implementation of the anti-aliasing filter is moved above the audible frequency range (which means that even less than optimal filter design will be inaudible). This was a much bigger issue with early ADCs, where the filters could audibly degrade the signal. With modern technology, it’s much less of an issue regardless of sample rate. Can You Hear the Unhearable? There are those who feel that frequencies in an audio source or signal above the 20kHz human-hearing limit can still be perceived or have an effect on the audio that is perceived. In this case, using a higher sample rate captures any higher harmonics or frequencies in the ultra-high range. Can you really hear those frequencies? Maybe, maybe not. In my opinion, it’s worth capturing the fullest signal bandwidth you can, just for safety’s sake. 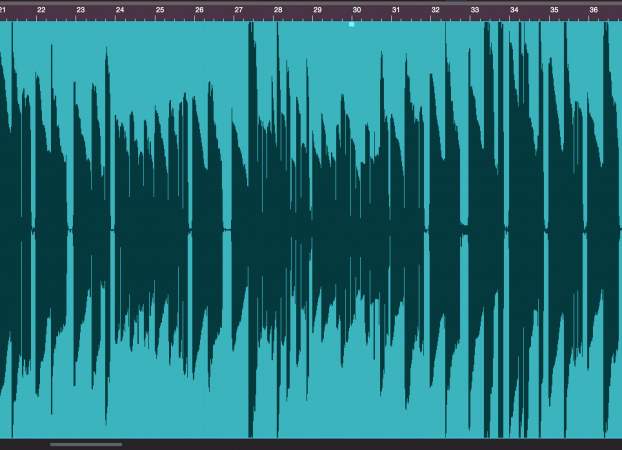 Does 96kHz Sounds Better than 44.1kHz? Sure. No. Maybe. The answer depends. I’ve compared some recordings at standard and high sample rates where I couldn’t perceive any differences. But I’ve also compared the same recording at high and standard sample rates and heard a difference. There are many factors that can influence this, but the biggest factor is the filtering in the ADC and the overall quality of the ADC. Some ADCs sound better at one sampling rate than another, but that’s due to the design of that particular converter rather than something inherent in sampling at higher rates. This doesn’t mean that you shouldn’t record at high sample rates; it depends on the sample rate at which your converters sound their best. In addition to this, some plug-ins sound better at high sample rates. Experiment and see what you think, both when recording and mixing. Personally, I generally default to a higher rate if the gear supports it, just to remove that variable from the equation. Is There a Downside to Recording at Higher Sample Rates? Maybe, maybe not. It depends. You’ll be taking up more disk space with a 96kHz session than you would with one recorded at 44.1 or 48kHz, but with today’s storage prices and capacities, this really isn’t a big deal. You’ll also be passing more data through your computer and on to the hard drives; some drives aren’t happy reading and writing that much data at once. Should you be working remotely, where you’re sending sessions over the internet, the larger the session, the longer it takes to upload it. The other place where you may run into issues with higher sample rates is when converting from a high rate to a standard rate (44.1kHz and 48kHz). But today’s sample rate conversion algorithms do an amazing job, so converting shouldn’t result in much, if any, noticeable degradation to the sound quality. Experiment; try recording and mixing tracks at different sampling rates with your own setup and in your own environment. If you like the sound better at one sampling rate than another, then by all means, record at that sampling rate!